I’ve said it before, music means a lot to me. It doesn’t matter what kind of mood you’re in, there’s always music that suits that mood. And music can easily change the way you’re feeling. A very well know song by Pharrell Williams is “HAPPY“. And that song starts with the following words: “It might seem crazy what I’m ’bout to say”. And that might be so, but the lyrics of that song in a way apply to the way upcycle design makes me feel. Yes, happy! In that song Pharrell also sings “Clap along if you feel like happiness is the truth” and “Clap along if you know what happiness is to you”. Well upcycle design to me is happiness. The uniqueness, originality and fun-factor combined with the history behind the design often make me smile and happy. Again, maybe it’s crazy, but I really think that upcycle design has the X-factor compared to regular design. And if you’re still not convinced, please have a look at the featured upcycle design in this post. 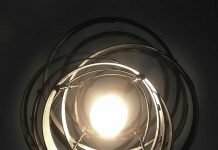 A piece of lighting made from an object that you would not have thought of. 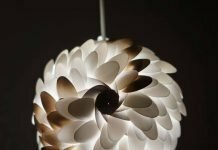 The upcycle lighting design is a chandelier called PETALS, designed by Juraj Vyboh, who lives in Bratislava | Slovakia. The studio is also the workshop where a collection of handmade and one of a kind lamps and furniture pieces are created. One of those magnificent designs is PETALS. It’s a stunning chandelier made out of school chairs backrests. Like I said, an object that isn’t the first thing on your mind when you think of creating a lamp. And Juraj Vyboh did and it resulted in this chandelier that resembles a giant flowery sculpture. First time I saw this chandelier I thought is was ‘just’ beautiful. But when you realise you’re looking at a flowery arrangement of upcycled furniture parts floating in mid air, that’s when that feeling of ‘happiness’ arises. The company was founded in 2009. He had been working for 6 years as an architect while part time creating his small design projects. Finally his hobby became a full time job. Conceptually, the pieces are usually based on repurposed materials and objects. The goal of Juro Vyboh is to search for different materials, like school chairs, and techniques to create an extraordinary but also fully functional atmosphere. Thereby making objects for those who want to glamorise their space with remarkable one of kind design pieces and a personal touch. To me this kind of [upcycle] design is pure happiness!